On Saturday 12 January, a training camp at the Panagoda Army Cantonment on drug prevention was held for past awardees of the Civilian Bravery Award. The awards have been running for over 24 years by The Foundation for Civilian Bravery and were created to acknowledge people who have attempted to, or have saved another person’s life. 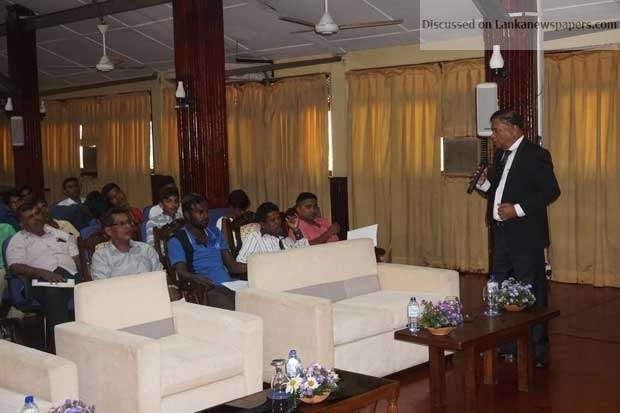 35 awardees from villages from all over Sri Lanka came together to participate in the programme in which they were coached to act as leaders in the social needs of their communities. These awardees were given formal training on leadership, as well the effects of drugs and how to help with rehabilitation. Dr K H Jagath Kumara – Chief Medical Officer of Health Homagama who spoke on the health issues of narcotics. Sampath Ududumbara – Police Constable – Community Policing on what is Community Policing? All participants have been recommended to be part of the Community Police and all the awardees handed over their applications for membership at the end of the training. At this occasion, certificates of participation in the Leadership Programme held previously was distributed by the chief guest R P R Rajapaksa , Additional Secretary Ministry of Defence.